This is our family now, minus the German shorthair pointer who is too incredibly lively to hold still. A beautiful friend, Charlotte, took time out of her busy schedule to come and photograph us for the Proverbs 31 website. There are several good ones, but this is a boy favorite because it includes Millie the cat. Today marks 10 months since my husband's death. I can hardly believe it. There's been so much accomplished, but there's so much left to do. I miss him. I made a trip to his office today, to return loaner fishing poles that friends had used over the weekend. I drove his truck to get there. I believe if I could put it on automatic pilot, it would take me there with no problem. For almost 20 years he worked there, 40 hours a week. I stepped into his office, where I've been working off and on for the past two months, trying to pack up all of his belongings. Today was my final packing day, I worked to fill the fourth huge container with publications and American Fisheries Society magazines that began in 1988, the year we married. One last look through his desk, just to ensure I'd gotten everything....and I got a surprise. Two pheasant's feet, with a wee bit of feathers still on the ends. Why in the world did he save those? They were tucked under some other items. It made me chuckle and shake my head as I pulled the crazy things out. Whenever he harvested a male pheasant in Kansas, he followed all laws to a "T", which meant he would leave one leg and foot attached on the dressed out bird. That would show anyone that might want to look at his game that his bird was indeed a male (females are not shot). My guess is that his "waste not, want not" mentality just would not allow him to toss the feet here at home. Keeping those in his desk drawer was safe. He could pull them out at his leisure, reminiscing about past hunts. Hunts with his dad, his friends.....and dream about the day he'd take his own sons out to hunt. Unfortunately he'll never take AJ and Ben out on our family land in KS to hunt pheasant. That's my job now. It'll never seem fair, but that's the way things are. As I put the lid on the final container, I felt like another chapter had been closed along with it. I was sad, that's for sure. But that's not his office anymore. It was just a space that he inhabited for 20 years, where he did a darn good job of managing the lakes and streams and rivers for his region of this great state. His coworkers loaded two of the four containers in the back of my truck, and I headed for home, pheasant claws beside me on the passenger seat. The boys got a chuckle out of the feet, too, and AJ remembered that his dad would save them while dressing the bird. Lucky for me, the boy has seen quail and pheasant cleaned and dressed several times, because that's one thing I haven't the slightest idea how to do. Full plate, full schedules, many responsibilities....but we're managing. Do we laugh? Oh, yeah, a lot! You can't live with two lively boys and not laugh most of the time. Do we miss him? Yes, to the depths of our souls. But we know where he is. And we have the certainty that we will see him again. Is he proud of us? Yes, I think he is. It's been an amazing few days. I think that's the first time I've written that particular sentence, whether in this blog, or anywhere else, since before Mark died, almost 10 months ago. But it has been just that---amazing. A dear friend forwarded me a daily devotion from Proverbs 31 Ministries several months ago. As part of "A Widow's Might" portion of their ministry, this devotion spoke to me. Deeply. So much so that I went to their website & subscribed to their daily devotions that very day. I look forward to seeing email pop up in my special "Devotions" folder. The messages always are heart felt and I feel, directed by God. It's wonderful to see a diverse group of Christian women, in various stages of career and life, all writing with such a great purpose...to spread the love of God, to make one feel they are not alone in their particular journey. A month or so ago, I was looking around the Proverbs 31 website (it's really cool, by the way, go check it out! ), and saw a small "contact us" link. I wanted the team of women writers responsible for "A Widow's Might" to know how much I have appreciated their stories of hope and encouragement. As almost an afterthought, I attached the link to my blog, just in case they were interested in me. I'd pretty much forgotten even sending them the link. As all moms of school children can testify, the month of May is silly crazy hectic---between field trips, parties, and wrapping up the school year, I don't think I've had the luxury of sitting down much this whole month. However, I checked my work email last Saturday, and guess what I found? 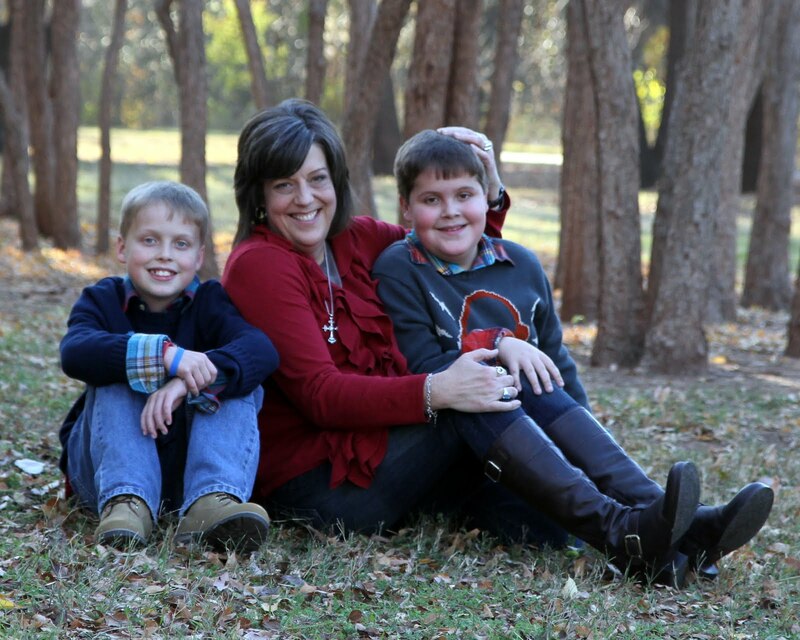 A personal note from LeAnn Rice, head of A Widow's Might writing team. She'd read my email, passed my blog link around to all team members and they have invited me to join them. Wow. Never in my wildest dreams could I have imagined this happening to a "left-handed girl from Western Kentucky".....a chance to be associated with such a wonderful group. I was blown, I tell you, blown away. Of course, I accepted. Since then, I've received some of the most welcoming emails from the team members. We all come from different parts of the country, with different struggles and family dynamics. The one thing we have in common is that we are widows. Christian widows. And as hard as that's been for me to get used to saying, that's what I am. And only the grace and majesty of God could've orchestrated this latest twist in my life. I'm not sure where it will lead me, but I'm more than happy to continue to give God the keys. He's doing alot better job of leading me and my boys than I could've ever done on my own. I've changed my prayers just this last week. I'm asking God to fill in the cracks of my life, of the lives of my sons. They've lost their earthly father, but I'm convinced their heavenly Father has more than enough power to "fill in the cracks" of our sadness, to stand in the gap whenever we need Him. Whether or not God has someone in our future to share our lives doesn't matter. Because I know now we will be okay regardless. "Take your everyday, ordinary life--your sleeping, eating, going-to-work, and walking-around life--and place it before God as an offering. Embracing what God does for you is the best thing you can do for him. Don't become so well-adjusted to your culture that you fit into it without even thinking. Instead, fix your attention on God. You'll be changed from the inside out. Don't quit in hard times; pray all the harder." LeAnn tells me she needs a bio of me and a picture to put on the website. Knowing I don't have any good ones, I wonder what to do. Offering up a quick prayer, I go about my business, getting the boys ready for bed. Within the hour, a friend sends me a message on facebook, wanting to know if she can take pics of us for the site. Yet another answered prayer. I'm a planner. Always have been. I like to look at my calendar, schedule upcoming events, and enter them into my day planner & phone. If I have extra time, I put them into my computer, too, for good measure. Mark and I had plans. His meticulously-drawn plan for our move to Kansas was something to behold. He started, at my urging, by purchasing 51 1/2 acres of home section pasture land, right next to the family farmhouse, a few years back. He studied range management, and began working on restoring the pasture from fescue back to beautiful native grasses. He planted native grasses in one area, where we planned on building a home. But he was most proud of the fact that, over the course of the years, as the fescue dwindled, the native grass that had been on the land for over a century was given new life, and sprung back into its former glory. He worked with local conservation agencies to draw up a plan for a pond. He had it dug just 2 1/2 years ago. Kidney-shaped, about 2 acres in size when full, it has a peninsula built into it where we would put picnic tables and outdoor furniture. The wild oats he ordered to have planted around its edge sat unopened in the local NRCS office at his death--a neighbor sowed those seeds last fall in his absence. Life's not fair. Things don't turn out the way "we" plan. I don't think God laughed at our plans. I just think things happen outside of our control. Sometimes good, sometimes bad. And on a rare occasion, as in our case, the rug gets yanked out from under you, causing a re-evaluation of everything you love and hold dear. I bought a new Bible. I am in love with it. Thanks to my Bible app, YouVersion, I've been able to read countless translations of scriptures. The translation that speaks most to me, at this particular time in my life, is The Message. Translated from the original Greek and Hebrew by Eugene H. Peterson, a minister, teacher, it is not intended to replace any other translation or the many excellent study Bibles available. It is first and foremost a reading Bible. He wanted to simply get people to read the Bible, to reach those who think the Bible is "un-readable" or too obtuse. It reads like a novel. A non-fiction novel, if you will. It's in plain language, and my 10 and 8 year old love to hear me read to them out of it. That alone was well worth the price I paid for it. "Do you want to be counted wise, to build a reputation for wisdom? Here's what you do. Live well, live wisely, live humbly. It's the way you live, not the way you talk, that counts. Mean-spirited ambition isn't wisdom. Boasting that you are wise isn't wisdom. Twisting the truth to make yourselves sound wise isn't wisdom. It's the furthest thing from wisdom--it's animal cunning, devilish conniving. Whenever you're trying to look better than others or get the better of others, things fall apart and everyone ends up at the other's throats. Real wisdom, God's wisdom, begins with a holy life and is characterized by getting along with others. It is gentle and reasonable, overflowing with mercy and blessings, not hot one day and cold the next, not two-faced. You can develop a healthy, robust community that lives right with God and enjoy its results only if you do the hard work of getting along with each other, treating each other with dignity and honor." "And now I have a word for you who brashly announce, 'Today--at the latest, tomorrow--we're off to such and such a city for the year. We're going to start a business and make a lot of money.' You don't know the first thing about tomorrow. You're nothing but a wisp of fog, catching a brief bit of sun before disappearing. Instead, make it a habit to say, 'If the Master wills it, and we're still alive, we'll do this or that'." Live for today. No one has the promise of tomorrow. As I listen to my wind chimes, creating beautiful music on my back porch, while birds sing and the sun peeks through the tree branches, I realize that today is enough for me. I can't worry about my acreage in Kansas, my pond, or where my family will be 2, 3, or even 5 years down the road. God will take care of the planning. He'll work out the details, and when the time comes to do whatever He wants for me and my sons, I'll know it. I trust Him. Mark wasn't brash in making his plans. He wanted what was best for his family, all the while, being true to himself and to his God. I take comfort in the fact that even though he is no longer on this side of heaven, some of his best years were spent making the dreams he had for that land in Kansas reality. There was no place he'd rather have been than tromping around that pasture, his pasture, cutting thistles and young cottonwoods, deciding what fish to stock in his pond. And in the process he made unforgettable memories for both his sons and for me. I can still picture him, as clear as day, cutting cottonwood trees with one mighty swipe of his 6 foot long hoe. Sweat dripping off his brow, smiling from ear to ear, so darn handsome in a plain white t-shirt and faded out Levis and boots. He likened being on the farm to being at a stripped-down spa, where good hard work, healthy food, and no cable tv was the norm. There's no other place quite like it, that's for sure. 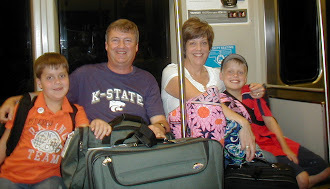 The boys and I will be there in some capacity in the future, but again, I'm depending on God to figure all of that out. "We don't yet see things clearly. We're squinting in a fog, peering through a mist. But it won't be long before the weather clears and the sun shines bright! We'll see it all then, see it all as clearly as God sees us, knowing him directly just as he knows us! And the best of these three is love." I admit it. I've had a crappy week. Worried about Benny, caught up in a sea of emotions that I just thought I had put behind me, I've been a "case" (Mark-terminology). Why? I consider myself to be a pretty smart cookie. I've been a Christian since age 11, when I accepted Jesus as my Savior at a revival in my little home church in Mayfield, KY. I've seen first hand the miracles God has worked in my life. He brought me through a very rough time early in my life. He packed up a man in Nebraska, and moved him to Murray, KY, in 1986, to attend graduate school, plopped him into one of my classes, and the rest, as they say, is history. He gave me two perfect sons, born without complications to two self-proclaimed "old farts" (Mark's term, again), whenever I was aged 38 and 40. He's carried AJ, Ben, and I as we've struggled with the loss of Mark. He's surrounded me with loving family, beloved friends, a support system that hasn't failed us yet. He can do anything. But, in this, my crappy week, I've questioned Him. Why couldn't my God, who can do anything, save Mark last July? 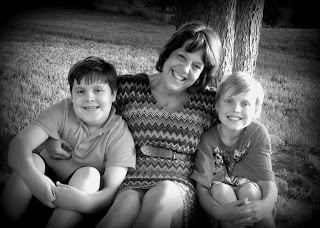 Why have I been left a widow, with two little boys to raise on my own? Why? I'm not really expecting any answers. There are none that would satisfy me, anyway. And then I stumble across the scripture above. AJ, Ben, and I (and Mark's mom, my mom, extended family, coworkers, friends, peers) are all squinting through the fog, trying to make some sense out of the circumstances we've been dealt. Only whenever the sun breaks through, and the fog dissipates will we see things clearly....will we understand why Mark's already in heaven. And that time will be when I get to heaven (hopefully a good 40 years or so from now). Mother's Day is Sunday. My sweet boys wanted to get me something. Knowing my unabashed love for all things James Avery, they suggest I go pick something out. I've had my eye on a ring. It's been a part of their collection for years. It has the words "FAITH HOPE LOVE" inscribed around its circumference, with a heart, a cross, and an anchor separating the words. I decided I needed a reminder of that scripture, since it stands for all that I believe matters in this world. I love the Message's translation of verse 13: "trust steadily in God, hope unswervingly, love extravagantly." As I look at that message on my finger, where I seem to twirl it incessantly, I am reminded to live that way. 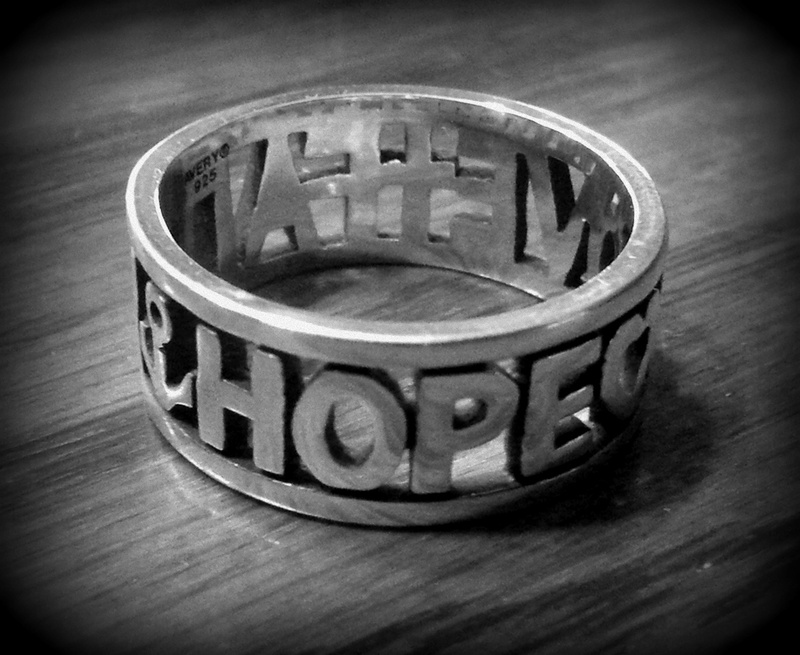 In all things I do, I am called to have faith, hope, and love. And if I'm truly living that, I can't stay in a crappy mood for long. I like to fix things. Blessed (sometimes cursed!) with a "way-type-A" personality (Mark's observation, he was correct, as usual), I need situations to be resolved, harmony to be found in discord, and order to be made of entropy. Looking at my life and house today, you'd never know that about me. Laundry's piled up, begging to be washed. The dishwasher's contents are clean and sparkly, been that way for three days---if I'd just take the time to unload it, the sink full of dirty ones could take their place. There are three, count 'em, three, unmade beds. And what am I doing? Sitting at my laptop, drinking my much-needed second cup of coffee, while the back door screen is open, allowing the coolness of the morning to creep into this messy house. My type-A personality has met its match--in my 8 year old. As much as I want, I cannot "fix" Ben's grief. Struggling, with what looks like the weight of the world on his young shoulders, he's just stumbling through life at the moment. It breaks my heart. No mother should have to watch as her two young sons try to make sense out of losing a close-to-perfect daddy. He softened my rough edges. He was the voice of calm and reason whenever my emotions got the better of me. He was "Mr. Fun" to my "Mrs. Reality." He made everything in our lives run smoothly, and he made it look so effortless. But he's gone, and the three of us are fumbling our way, trying to bring some sense of order and routine to the complete chaos we were left with. Ben's feeling emotions now that he stifled, buried deep within him for months. He tells me he has a "sucky life." When I press him for details, he tells me he's stressed out at school, overwhelmed by homework and deadlines. This from a child who has gotten 98, 99, and 100s on his report cards all year! Whenever I ask him if others are struggling, too, he's not sure. I urge him to bring home the work so he can finish it without interruptions. He starts out in his own bed each night, but ends up in mine before daybreak most mornings. His sparkly brown eyes seem a tad cloudy; in his normal happy-go-lucky gait, you see a slow, underlying sadness that just won't let go. His posture has begun to slump from the weight of the grief. I am worried about him. I don't know what to do for him. And this morning, as we are running late for school, he sits on the couch, in underwear and socks, hair uncombed. I urge him, three or four times, to finish dressing, that time's a-wasting. Nothing. In my next pass through the den, I raise my voice. He bursts into tears, and runs to his room. Great. I am only human, and patience is a virtue I'm continually working on. I go to apologize for yelling. He finally finishes dressing and begrudgingly puts his backpack on. I tell him there's only 12 more days of school. This summer will hopefully be a season of healing. With no schedules, no deadlines, no demands on any of us (except my outdoor column once weekly), I pray that we can begin to put our lives back together. Right now, it feels like we're functioning on a wing and a prayer, with a great deal of duct tape keeping us together. We're broken. We're not sure of our future. And as I see my Benny, seemingly drowning in a sea of grief and sadness--I want so badly to pull him from the deep water. But I know I cannot. Only God can do that, as He did for me, and for Andrew. The water I tread isn't quite as deep as it was, that's for certain, but there are days that big giant waves still knock me off of my feet. And let me tell you, the worst days I've had personally are nothing compared to watching my sons suffer their own personal pain. I've lost a spouse, a lover, a best friend. But they've lost their dad, their male role model. I pray for them, without ceasing. I cry out to God and ask Him to take away their pain. I ask Him to give their pain to me. I'd give anything to see my Benny smile again, to hear that silly giggle, to see the light sparkling in those enormous brown eyes that seemingly look into my soul. It's my job to see that he thinks he has a "sucky life" only for awhile. I pray for the wisdom to get him through this. I pray for God to reach in and pull him out of the deep water quickly. As I typed that last sentence, in my mind, I see Mary, mother of Jesus, watching her son be crucified. I cannot imagine her pain. I feel so guilty. Here I sit, worrying about my sons, when she had to endure His dying, right in front of her. For sins He didn't commit. Thank you, God, for putting that image into my mind. For showing me that the pain I feel is nothing compared to the pain both you and Mary felt as you watched your Son hang on a cross for hours and die. Surely I can help my sons get through this grief, with Your help. "You are on the path of My choosing. There is no randomness about your life. Here and Now comprise the coordinates of your daily life. Most people let their moments slip through their fingers, half-lived. They avoid the present by worrying about the future or longing for a better time and place. They forget that they are creatures who are subject to the limitations of time and space. They forget their Creator, who walks with them only in the present. Every moment is alive with My glorious Presence, to those whose hearts are intimately connected with Mine. As you give yourself more and more to a life of constant communion with Me, you will find that you simply have no time for worry. Thus, you are freed to let My Spirit direct your steps, enabling you to walk along the path of Peace." Dear God, help me be strong enough. For not only me, but for our family of three. Amen.